Brooklyn students embroider their ideas: Part 2 | Be Nice. 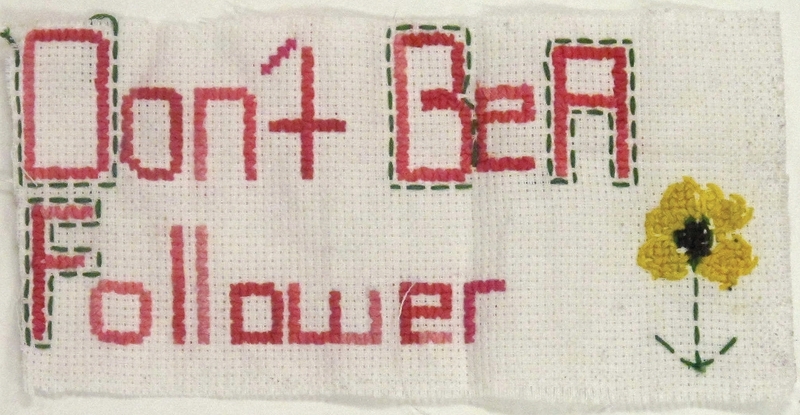 Don't be a Follower, by Jada G.
I like the way this piece has the capital letters outlined to add emphasis. My husband wondered if Jada cleverly added a flower because its spelling and sound is so close to “follower.” Very nicely done Jada! I would beg to differ, Matthew! It takes a lot of focus to do a piece like this (especially with the different colors on every letter)! It is obvious you are mastering that skill. So many people will benefit by hearing another point of view–I hope Jorge achieves his goal! This entry was posted in Amicable Allegories, Brooklyn students embroideries, Nice Notions, Nice Reading Material, What "Be Nice" is all about and tagged affirmations, aida cloth, art, Be Nice, Brooklyn, crafts, embroidery, middle school by Jen. Bookmark the permalink. LOVE the first one. I have taught kids to stitch before and a very impressed with ho focused she managed to get them!! Yes, I agree! That’s what really blew my mind–they’re so well done and interesting to look at!